1977 seems like ages ago. 37 years of relevancy in Hip Hop culture is definitely something to celebrate. This past Sunday, New York City’s Summer Stage presented Rock Steady Crew’s 37th Anniversary concert in Central Park. The Rock Steady Crew is a household name in Hip Hop. Culture connoisseurs of varying generations came together this past Sunday to pay homage and witness “Real Hip Hop.” While many debate what “real” Hip Hop is, every guest that hit the stage proudly boasted, “This is Real Hip Hop.” For the sake of the culture, let us not forget the four elements. The b-boy has been a staple since the culture came into fruition. B-boys, Crazy Leg and Lenny Len, were put onto Rock Steady through Jimmy D as a way to preserve the art form of breakdance. Their mission was to take it to the next level while keeping the culture alive. By the early 1980s, the Rock Steady Crew was making a lot of noise in the Manhattan scene. Battling their rivals, the Dynamic Rockers, was a crucial point in the history of breakdancing and Hip Hop. Today, Rock Steady Crew has expanded and become a fusion of the old and new school. On Sunday, July 27th, Rock Steady Crew added another chapter to its legacy. As the show began, I looked out into the sea of faces and noticed the blend of races, genders and ages in the crowd. The crowd was proof of how far Hip Hop has come in truly reaching the masses while breaking through racial barriers, age gaps and gender roles. Hosting the anniversary event was the End of the Weak emcees. EOW, as many know it as, is NYC’s longest running Hip Hop open mic showcase and it was only fitting to let them host the monumental event. Being in the photo pit, I was able to witness not just the levels of greatness that touched the stage, but also see so many people still supporting “real Hip Hop.” It was a reassuring sign that Hip Hop will be well preserved throughout the years to come. The first half of the event was led by notable pioneers of the culture. Large Professor, Cormega and Das EFX all touched the stage and the crowd loved every minute of it. Considering that the majority of the crowd was made up of people in their 30′s, they grew up to these artists’ music and they were rapping along to every word to every song. Cormega took some time out in his set to address the crowd and see which age group was reaping the heaviest. “If you’re over 30 years old, make some noise,” he shouted and the crowd went berserk. There were kids looking at their parents with surprised faces, not being able to fathom at the fact that their parents grew up on Hip Hop as well. I ran into Onyx before they got on stage to perform, as well as Spliff Star, who was there to support his fellow Hip Hop veterans. The energy backstage was great as well. I saw the old school mingling with the new school and artists mingling with the people as they talked about “back in the day Hip Hop” and took photos. When Onyx came out, it felt like we were teleported back into the 90s. The grit and rawness that embodies both Fredro Starr and Sticky Fingaz was beyond apparent. Onyx never lost their street edge and their age never showed as the duo sustained a high-energy performance that was all a Hip Hop fan could ask for. The show was full of surprise guests as well. Beatbox legend Rahzel came out and proved to us, once again, why he is so great at what he does. Keith Murray also took it back with “Fatty Girl” and brought a big surprise guest of his own, the Ruler himself, Slick Rick. 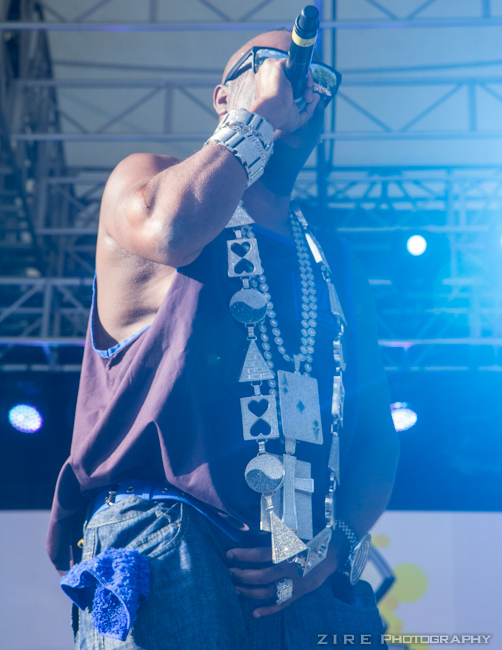 Decked out in chains, of course, Slick Rick had the crowd mesmerized. As the day winded down, DJ Tony Touch made an appearance before the final performance of the night took place. Rightfully introducing the crew, Rock Steady Crew originator Crazy Legs took to the mic and said a few words. Crazy Legs first thanked the crowd for the many years of support for the culture and keeping the Rock Steady name relevant after so many years. He also made a special announcement by presenting the newest Vice President of RSC: Y-Not. Adding to his own legacy, Crazy Legs also shared the news about his contribution to Cornell University. The prestigious school will be keeping all of Crazy Legs’ Hip Hop archives in their Hip Hop Collection. “We’re here to preserve Hip Hop and I’m glad to be able to donate everything I’ve collected over the years to Cornell University,” said Crazy Legs. After bearing the good news to the packed out Summer Stage audience, the newest members of Rock Steady Crew literally swept the floor clean with their mind-blowing foot work, leg swipes, flare kicks, chair freezes, pop locking and more. Y-NOT, Bonita, Bail Rok and more all took turns wowing the crowd with their skills. It was a refreshing sight to see, to be able to witness a new generation of b-boys and b-girls who will continue to carry the torch that Rock Steady Crew initially carried over 30 years ago. Hip Hop isn’t dead. And this year’s Rock Steady Crew Anniversary was a friendly reminder of why it isn’t.